Crimson Love, our shocking signature Eco Artisan Spice Blend, mingles dried ground organic beets with spinach, garlic, rosemary & nori. A Garlic Lover's Blend, sprinkle this spice blend on anything you can imagine sprinkling with garlic & rosemary. Salads, soups, stews, pasta, meats, fish, eggs. Amazingly addictively yummy, toss this 100% raw organic superfood blend on RAW zucchini noodles and stir with a little coconut oil and hot water for Magic Raw Food Pasta & Sauce! 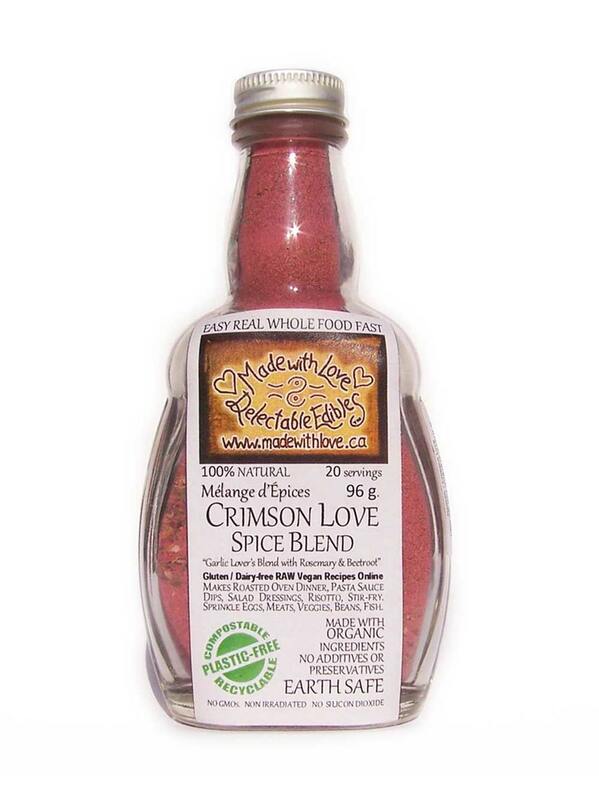 1 Tbsp Crimson Love has between 10-30% RDI of six major nutrients in a RAW whole food organic form. Add extra real veggie nutrients to any meal but it just tastes like garlic! Secretly in this salt and sugar free spice blend, the powerful super food nutrients of whole organic beets, spinach, carrots and nori sneak quietly into your everyday meals, and nobody even knows they are there.. Kids LOVE bright pink "fettucine alfredo" just like mac n cheese but way cooler! Just sprinkle cooked pasta noodles with Crimson Love add light cream and parmesan cheese and stir over medium heat to thicken. We LOVE buckwheat soba noodles, smothered in Crimson Love sprinkles, engivita yeast and natural sea salt. YUM! Superfood supplement meets comfort food craving - delicious. Our 4.5oz medi-size glass bottle is hand-dipped in beeswax and will make 20, "10 minute" pasta bowl dinners with a rich gorgeous real cream sauce or a decadently divine clear sauce. Gluten-free, Vegan, Raw and Dairy-free recipe options provided. 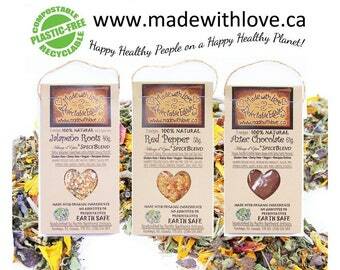 Crimson Love: dried beet, garlic, spinach, carrot, herbs & spices, nori flakes. Made with Love - It Feels Good.